A sterling set let down by some frustrating niggles. Nice balance of sounds. Great atmospheres and melodics. Primitive Kontakt engines. Uninspiring interface. 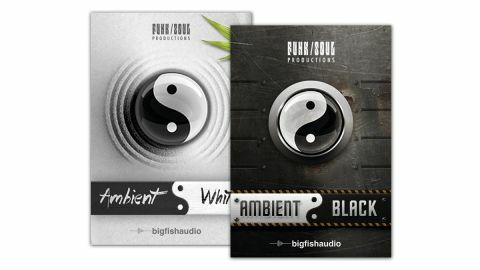 Produced by Big Fish in conjunction with Funk Soul Production, this twin pack of Kontakt Player instruments (also available separately for £139 each) takes on the darker, moodier side of aerated electronic production with Ambient Black, and the lighter, prettier aspect with Ambient White. Instrumentation-wise, both feature roughly the same patch categories (drones/pads and atmospheres, basses, percussion, melodic instruments, loops, etc) and draw largely on recorded and found material, with some synthesis. The differences between their sounds within those categories, however, are profound, Black's atonal, edgy, industrially influenced noises contrasting beautifully with White's chilled-out, harmonious musical tones. Like Funk Soul Production's last release, Zodiac (8/10, 200), the two scripted Kontakt engines are very primitive. Black features amount sliders for Distortion, Low-Fi and Limiter effects, White sports ADSR envelope controls, and both include a convolution Reverb (with a choice of ten IRs), Bass and Treble controls, and a feedback Delay. Not terribly exciting, then, and we're rather disappointed that a year and a half since Zodiac, Funk Soul is still content to build on such half-hearted foundations. Fortunately, what they clearly lack in scripting chops, they make up for in sampling and production prowess. There are some truly jaw-dropping sounds to be found here, particularly among the atmospheres and melodics. The stars of both libraries are the Multi-Layered Instruments, which thoughtfully combine pairs of patches from all categories. Back on the down side again, there's wide variance in the application (or not) of multisampling, with many of the patches stretching single samples across the note range, and lots of the multisampled ones having only one velocity layer. The drums and certain FX patches, meanwhile, are presented in 'menu' format, mapping separate sounds up the keyboard, which is handy. In their stylistic juxtaposition and sheer sonic quality, Ambient Black & White make a very successful team, but inconsistent multisampling and an underpowered interface do rather let the side down, undermining the relatively high price and not doing the sublime samples justice.